Ever get that really cool idea for a t-shirt or spirit wear and wonder what’s the best way to sell it? Or better yet, you’ve tried selling them before and had poor results? Here is a typical conversation we have with customers. They have some people at their school who are interested in getting spirit wear made. They think it’s a good idea and figure they can open up sales school wide to include the students families and even school alumni. Once they get their ideas down and their products and designs picked out. We ask how they are going to sell this to people. We always get one of two possible answers. The first answer is they are going to create order forms and send those home with the weekly folders and post a downloadable version on the school website. The second answer is they are going to order a bunch of apparel and sell it at an impromptu folding table in the school entry foyer. While both of these traditional ways of selling custom school spirit wear have worked. 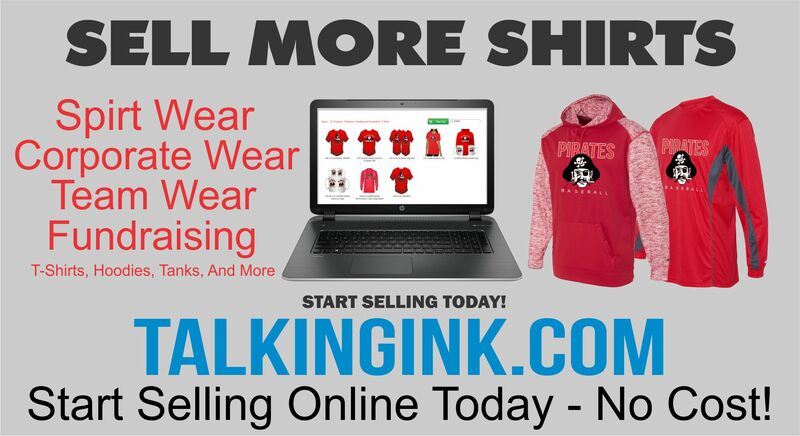 There is a better way that involves a way to sell more t-shirts online free. These traditional ways either involve a lot of time and headaches (order forms) or they involve investing money up front (impromptu spirit wear table) which may or may not be profitable. In fact, the middle of writing this post a customer came in looking to order shirts for the incoming freshman. She came in to get a quote and told us what she was going to do. Which was send a mass email out to all the incoming freshman and current students in her optometry department. It was going to take a lot of work and time on her end. She would have to gather all of the email responses and then build a spreadsheet to provide us. So we tell her about our free online stores she can use to sell more t-shirts online. She suddenly get excited again about this fundraiser because now she just has to send a link to everyone and we do all the work. She just simply has to pick up the orders which will be bagged individually, and hand them out at the event. She will also get a check for the funds raised which will be the difference of what we charge her and what she charges the students. The best part of she isn’t getting quotes any more because she found a price that works for her and a solution that saves her a lot of time. People are more prone these days, to participate in a fundraiser if they can whip out their credit card while they are online. People are always online so it makes perfect sense. Our free stores free up your time and resources and allow you to sell more t-shirts online. Here is a link to a sample store to show you it’s functionality. Here is a link to contact us to learn more.